Invite a few new friends to your next party. 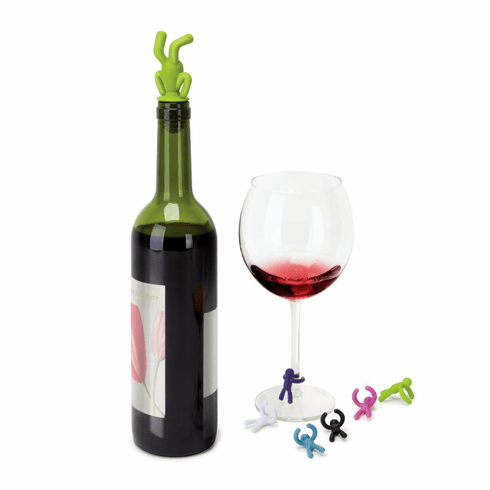 Shaped like little stick-figure men, the Drinking Buddy bottle stopper and matching wine glass markers from Umbra will amuse guests while performing their important duties. Use the Drinking Buddy stopper to cork an open bottle of wine in order to slow its oxidization. His head-down position in the mouth of the bottle is certain to prompt a few giggles. Meanwhile, his six charming pals hug the stems of wine glasses with miniature outstretched arms and their assorted colors-white, purple, blue, black, pink, and green-help guests identify and keep track of their drinks. All seven pieces are constructed of flexible, food-safe molded rubber. Hand wash or wipe clean. Stopper measures 3-1/2 by 2 by 1-inch. Each glass marker measures 1-1/4 by 3/4 by 3/4-inch. Designed by Alan Wisniewski for Umbra-the worldwide leader in casual, contemporary and affordable design for the home.